Armstrong Flooring has been named a Partner for Progress award winner by the Oklahoma Association of Technology Centers. 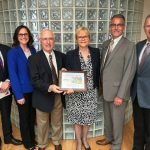 “This award recognizes businesses and industries that have made outstanding contributions to business improvement, promotion, development and progress through CareerTech education,” said Rebecca Eastham, Executive Director of Business and Industry Services at Meridian Technology Center. The partnership between Armstrong and Meridian began shortly after the Stillwater flooring facility opened in 1989. 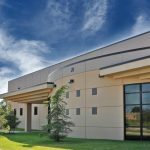 The company established its commitment to the value of career training when it established an endowed scholarship for the Meridian Technology Center Foundation, providing an annual scholarship to an adult student in one of the school’s manufacturing programs. Armstrong Flooring’s collaboration with Meridian has existed for nearly three decades. Not only has it had an impact on individuals who are currently employed in the manufacturing, the relationship has also been instrumental in creating awareness of the resurgence of manufacturing and its economic outlook for the next generation of workers. 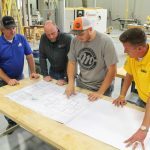 Beginning with new employee skills training and safety to ongoing supervisory and employee development, Meridian and Armstrong Flooring work together to provide skills training for its 110 employees. Armstrong’s commitment to safety and quality has earned them multiple awards including the Governor’s Award for Safety Excellence and OSHA’s Voluntary Protection Programs designation. Armstrong Flooring is an active member in the Stillwater Area Manufacturing Council sponsored by Meridian and has hosted meetings on-site. Members of Armstrong Flooring’s leadership team serve on business and education councils at Meridian where they help shape program curriculum and providing insight on upcoming industry needs. They open their doors each October for Manufacturing Day and share their passion for quality manufacturing with local students to help encourage careers in this important industry.